This PowerPoint presentation was developed for use by any parent or teacher interested in starting a health and wellness committee. The presentation gives you the option of personalizing the presentation, by allowing you to add your schools logo. 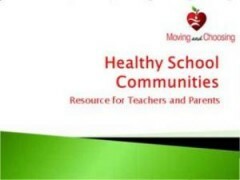 It has information on why health and wellness committees are needed, as well as ideas/areas to start working on to make your school healthier.